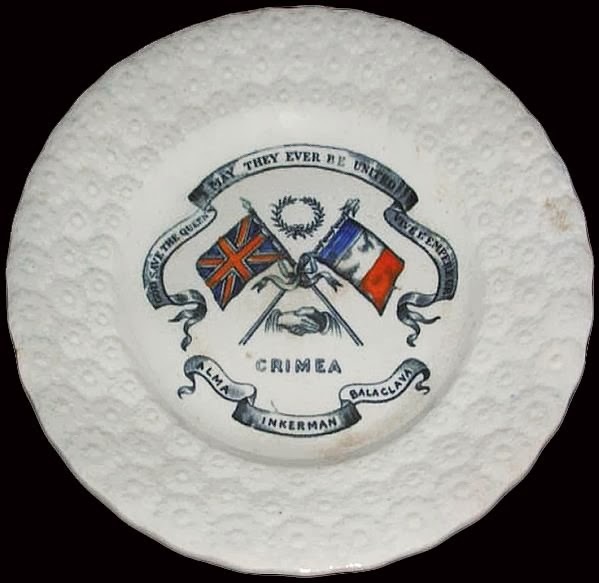 A 6.6 inch child's plate that celebrates the alliance of Britain and France during the Crimean War. The three battles in the banner, Alma, Inkerman, and Balaclava were British/French victories. I often wondered why there were so many transferware patterns that commemorated the Crimean War (for example, there are 25 Crimean patterns in the Transferware Collectors Club Pattern and Source Print Database.) In the last few weeks, I have learned a lot of Crimean history as well as current events. An excellent article by David M. Herszenhorn in the N.Y. Times titled Crimea's Bloody Past Is A Key to Its Present helped me understand more clearly the importance of the mid-19th century Crimean War. 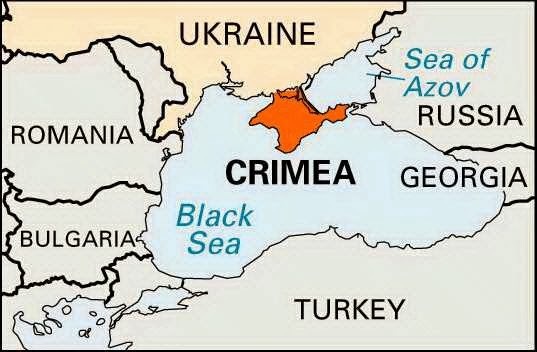 Where is Crimea? I have to admit that I wasn't sure where it was. I did think it was part of Russia or the Ukraine (all four of my grandparents were from the Ukraine and they used the article the when speaking about their homeland). You can see that Crimea and Ukraine in the map above are part of Russia. 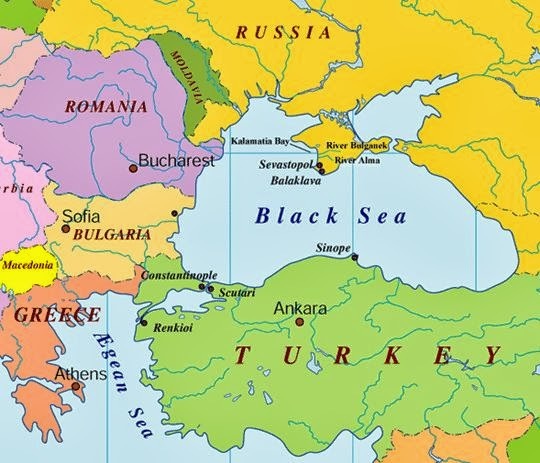 They are not part of Russia in the map below. Ownership seems to change often. 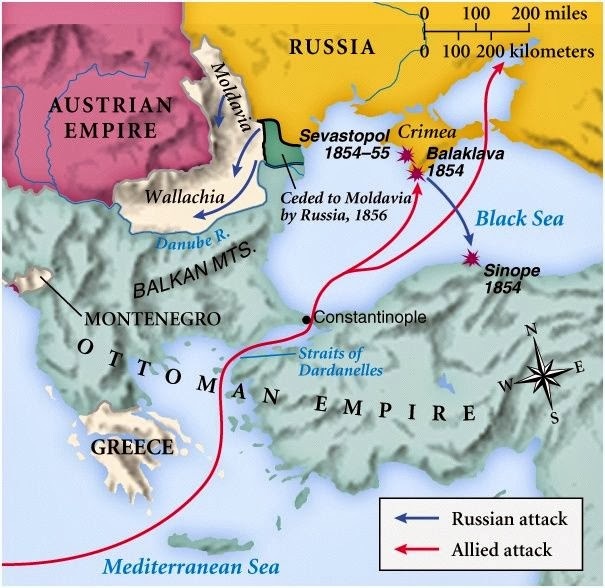 The Crimean War (1853-1856) pitted Russia against the alliance of Britain, France and the Ottoman Empire (the Kingdom of Sardinia is somewhere in there too). It is considered the first modern war. Nearly a million men were killed, and it was the first conflict to use photography, the telegraph and newspapers. I read that the seeds of many of the 20th century wars were sown in the Crimean War. Twenty-first century wars too. Now for some transferware. 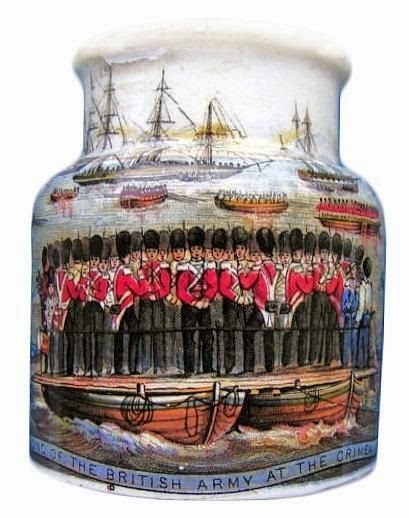 Below is a jar showing The Landing of the British Army At The Crimea. John Thomas & Jos Mayer (1842-1855) jar illustrating The Landing Of The British Army At The Crimea (notice the article the is used before Crimea/I have some idea about this. Your thoughts? The pot lid below is titled Alma which was one of the first major battles of the Crimean War. 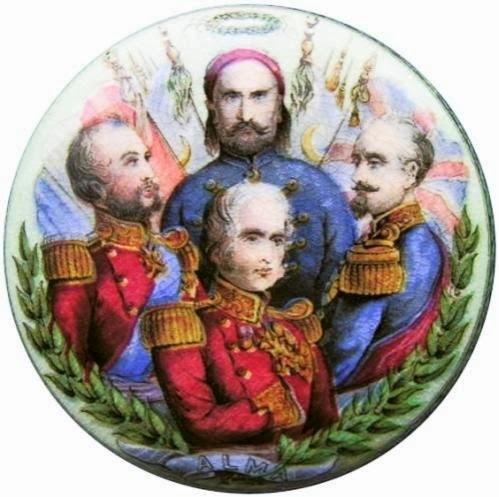 The men were some of the major players (an odd word for warriors): Omar Pasha, an Ottoman general; Lord Raglan, commander of the British forces; Marshal St. Arnaud, commander of the French forces; and the Duke of Cambridge, Prince George, the grandson of George III. The jar illustrates a scene from the battle of Balaclava, and the plate shows Sebastopol, also spelled Sevastopol, which was the site of a year-long siege. 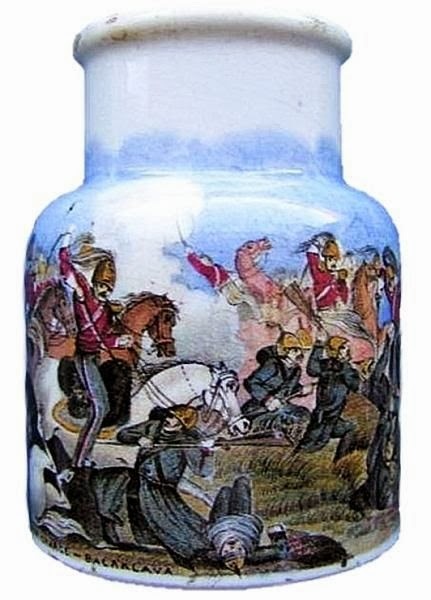 John Thomas & Jos Mayer (1842-1855) polychrome jar with a scene of the battle of Balaclava. 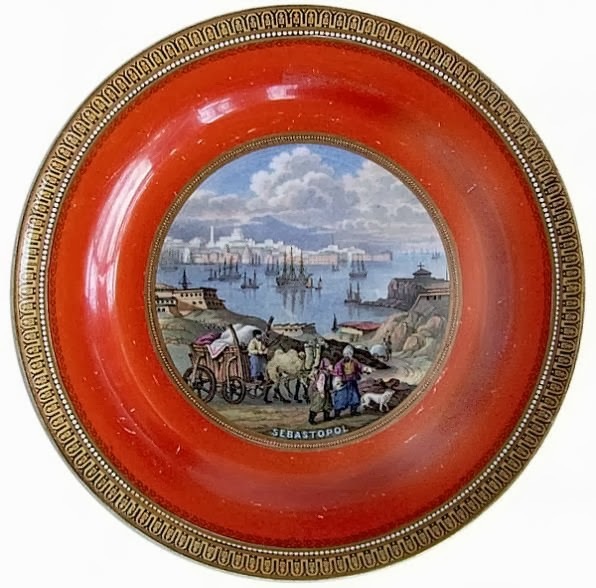 F. & R. Pratt (1818-1920) 8.6 inch plate, Sebastopol. In 1854-55, the city withstood an eleven month siege by French, British, Turkish and Sardinian forces. The city endured another siege by the Germans during WWII. 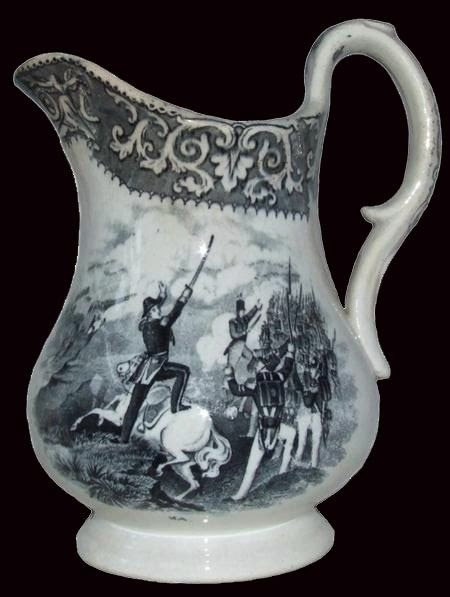 Below is a jug that shows two scenes from the Crimean War; Alma and Sebastopol. As I have mentioned in prior posts, British potters capitalized on popular culture. 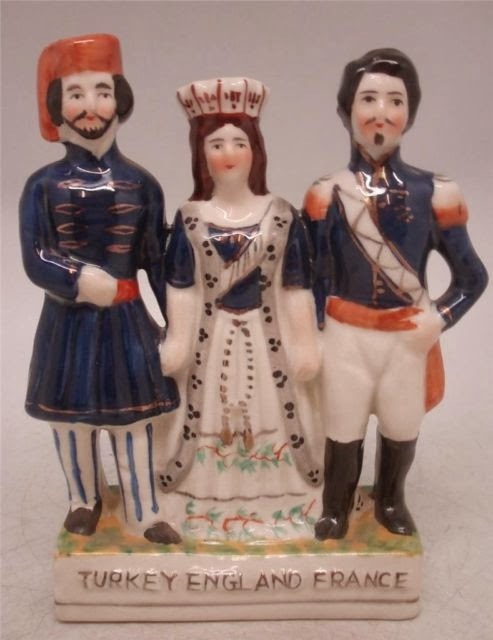 Although not transferware, there are many Staffordshire figures that feature Crimean War subjects. Thank you Julie, for more pieces I have not seen before. All our history seems to be told in our ceramics! We learn a lot from pots! Interesting information Judie. Thank you. It is an interesting subject. Glad you like it! Hi Judie, I was delighted to come across this post as the result of a Google image search. I was looking for a pot similar to one I have just purchased, and saw your John Thomas & Jos Mayer pots. Mine appears to be the exact same shape, and shows "The fall of Sebastopol 8th Sept 1855". Mine has no makers' mark and the colours are so very crisp that I wondered whether it is a modern reproduction. However, when I picked it up it seemed unusually heavy for its small size (it's just 3.5 inches tall and has a base diameter of 2.5 inches and just over 2" diameter at the rim). The weight turned out to be caused at least in part by a concave internal base, so it's a bit like feeling the inside of an egg. The extra strength may have aided its longevity. Are yours like this?? As John Thomas & Jos Mayer apparently stopped production in 1855 according to your post, if this is theirs, presumably it would be among their last work. The illustration spans the full 360 degrees of my pot. On the rear there is a dissassembled canon, some wicker storage containers and a redcoat lying down, possibly wounded, with a fleet of ships in Sebastapol harbour in the background and fires, possibly from firing canons, on the far hilltops. The front shows a great many more redcoats, marching with fixed bayonettes this time, and a mystery! Because in the foreground, two of them are carrying a man on a stretcher. But this does not appear to be a wounded redcoat, as you might expect, for the figure wears a blue tunic and what appears to be a nightcap. He cannot be badly wounded, if wounded at all, for he is sitting bolt uptight and waiving to one of the redcoats (who returns the waive). Was he, I wonder, a VIP POW, just released? Hi Stephen, I also think your jar is original. 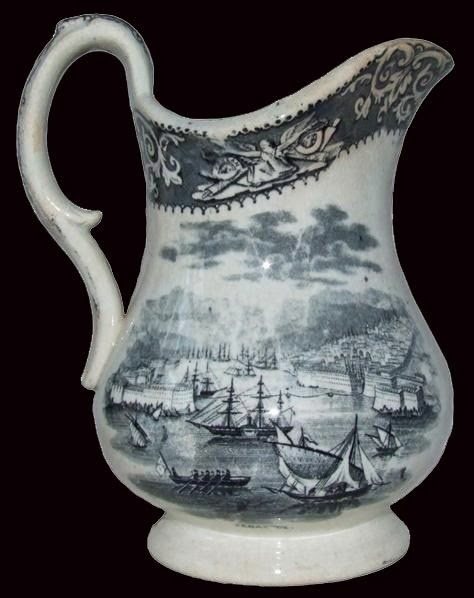 The information about the manufacturer and more is from the Pattern and Source Print Database of the Transferware Collectors Club. The entry references the book "Pot-Lids and Other Coloured Printed Staffordshire Wares" by Keith Mortimer, 2003. The jar is illustrated on p. 182, plates 511 and 512 (same pattern). Plate 511 is titled "The Fall of Sebastopol, etc." and Plate 512 is titled "Sir Harry Jones." According to the TCC entry, Sir Harry Jones, who was head of the Royal Engineers at Sebastopol, may be the person being carried off on the litter, as the original title of the design is "Sir Harry Jones." However, there is no record that Jones was wounded during that engagement. Hope this is helpful information. Judie, that's wonderful information! BTW, this little pot cost me all of £2.49 in a charity shop (about three dollars?) - a great investment whatever its worth as it's given me a lot more than that in pleasure already! Apparently the Russians abandoned Sebastopol overnight following a combined apparently unsuccessful Anglo-French attack, torching the settlement as they left. That might explain Sir Harry's nightcap. Thanks so much + happy transfer-wareing! "I cannot sufficiently express my approbation of the conduct of the Royal Engineers under Lieutenant-General Si Harry Jones, who has conducted the siege operations from the beginning of this year. For some time past he has been suffering on a bed of sickness, but the eventful hour of the assault would not permit him to remain absent; he was conveyed on a litter into the trenches to witness the completion of his arduous undertakings"
Thank you Stephen! I love learning history from pots! Hi, I have a landing of the British army at the Crimea pot. I retrieved it from a ship in 1976 that sank in 1855.